The story of Gajasura Shiva was narrated by Sage Dadichi to Daksha – who was conducting a yajna without paying respects to Shiva. The story was meant to quell the ego and pride of Daksha Prajapati. The story of Shiva and elephant demon Gajasura begins with the demon performing rigorous penance. Pleased with the rigorous penance of Gajasura, Brahma gave him several boons. He got the most important boon indestructibility except by Shiva. With boons like longevity, untold wealth and unfathomable strength, Gajasura became arrogant and attacked the three worlds. He subjugated the demigods, saints and other divine beings. His rampage was unstoppable. When he attacked earth, people ran and took refuge at the Manikarnika Temple in Kashi (Varanasi). Gajasura soon attacked the temple and people ran into the sanctum sanctorum and clung to the Shivling. When Gajasura attempted to storm into the sanctum sanctorum, a blazing light emanated from the Shivling. The light subdued and Shiva stood before his devotees armed with Trishul. Arrogant Gajasura had forgotten about the conditions of his boons. He rushed towards Shiva to attack. He roared in fury and it echoed through the universe. In a swift move, Shiva flung Gajasura to the ground and violently stamped on his head. Blood spurted through his ears, mouth, and trunk. 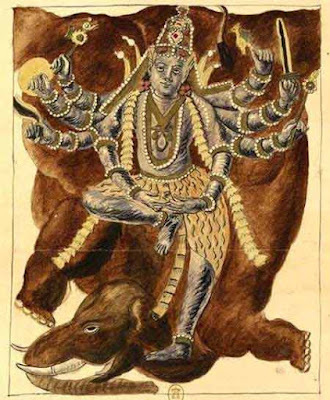 With a ruptured neck, Gajasura soon attained mukti as he had the rare luck of being killed by Shiva. Shiva now radiated the brightness of a billion suns. The cosmos was blinded and to cover the brightness, He stripped Gajasura of his hide and covered his radiant torso.